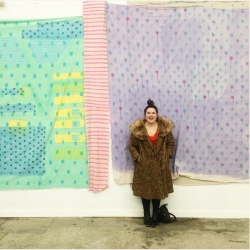 PRINTPARTY is the re-imagination of the hand-dyed quilts of Krista Jo Mustain. Through this project the artist, who has historically worked solely with Textiles, will be translating her quilt designs onto opaque vinyl wraps to be installed on the bus shelter located at 11th and Walnut. Mustain’s work is bold and bright; layering colors over each other and bringing to the surface pattern combinations that are often unexpected. The project will be executed by producing up to five vinyl renderings of Mustain’s prints, which will then be cut up into new shapes and applied in a layered manner over the body of the bus stop. The ceiling of the structure will be covered in a vinyl print of Mustain’s hand-cut confetti, which will reflect and produce shadows mimicking the confetti. PRINTPARTY is a piece about enjoying yourself in the midst of your everyday activities, breaking away from the mundanity of city life. This piece is installed at the bus shelter located just up the street from Oppenstein Park at 11th and Walnut. Krista Jo Mustain, of Print Party, is a fiber artist and textile enthusiast who specializes in hand-dyed quilts for people who are serious about fun. Mustain, who is currently living and working in Kansas City, was raised in Spring Hill, KS and received her Bachelor of Fine Art in Textile Design from The University of Kansas. 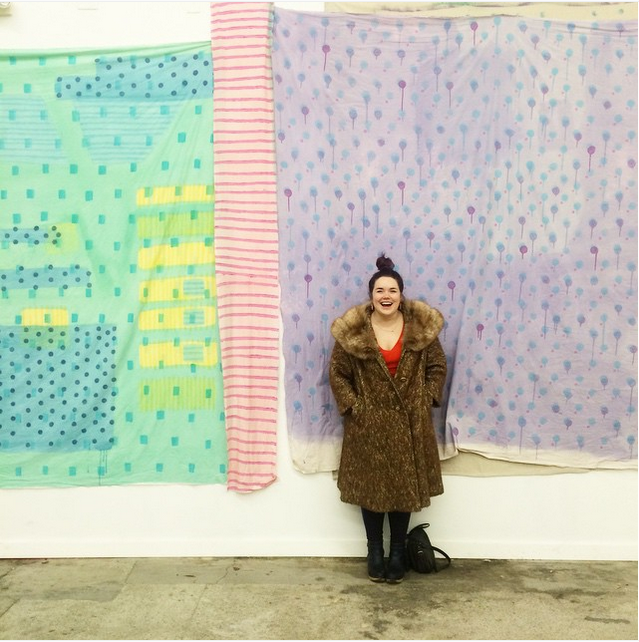 Mustain is working on launching a new collection of quilts, which will be released late summer 2015; follow her work on Instagram @printpartyprintparty.